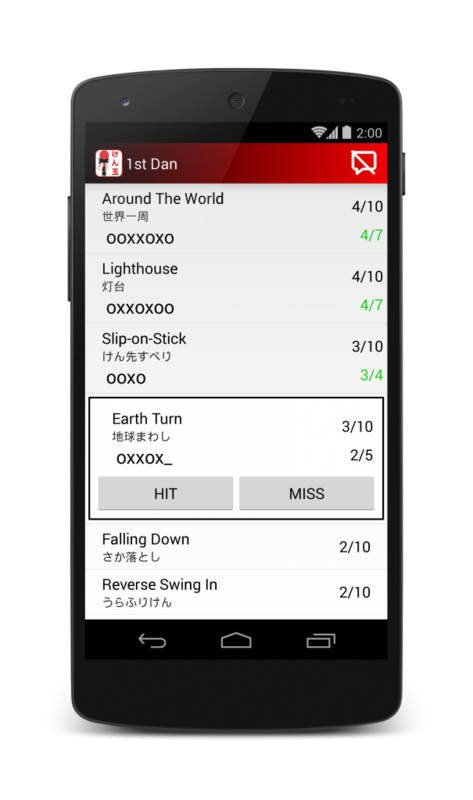 There is a new version of KendamApp – The Kendama App out there. It includes 32 new videos and my favourite feature so far: Self Certification. Until now you could track your accuracy per trick, and then see how close you were to pass an exam, but an actual exam… that is another story. This new feature allows you to try for a self certification. It tracks all the attempts of all the tricks and it tells you if you passed or not the grading. As in a real exam, you don’t have to keep going with a trick after you’ve completed the required hits, and as in a real exam, you stop as soon as you miss one trick. It also keeps track of your attempts to the grading. Note that the tricks performed during the self certification are not added to the trick tracking feature, it is a different feature. An image is worth a thousand words, so here’s a screenshot of the self certification in action. There is a new version of KendamApp - The Kendama App out there. It includes 32 new videos and my favourite feature so far: Self Certification.